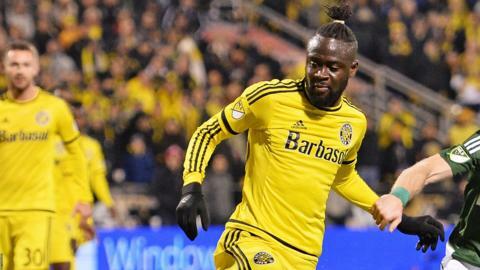 Sierra Leone forward Kei Kamara has signed a new deal with Columbus Crew in Major League Soccer (MLS). The 31-year old has extended his contract just ahead of the new season and keeps at the club until 2018. He is the second designated player on the roster list in the current Columbus Crew squad after Federico Higuain. "I feel really great to sign a contract with Columbus, this is the team when I first started playing my professional career," he told BBC Sport. "For them to trust me this much and give me a longer contract and as a designated player this is a true blessing for me. "I am looking forward to the season to start and I'm looking forward to my future as part of Columbus Crew." "We are proud to be able to offer Kei a contract extension." "To me, he is a true success story in this League: a player who has worked his way up the ranks and now has earned a designated Player contract following one of the most prolific goal-scoring seasons in MLS history last year. "It also demonstrates tremendous support from Mr. Precourt in signing two pesignated players and showing his ambition for where he wants this club to go. "This is great news for Columbus and I am excited to see what Kei can do this year," Berhalter added. Kamara, formerly of Middlesborough and Norwich City, had a good 2015 season scoring 26 goals in MLS regular and play-offs combined. He finished joint top goal scorer in the MLS regular season netting 22 goals but lost out on the golden boot award to the the Italian Sebastian Giovinco who provided more assists. Kamara is the second Columbus Crew player to hit 20 goals a season and helped his side to reach the 2015 MLS Cup final. Amongst his many awards in 2015 were three MLS player-of-the-week titles.